Sometimes life can feel like a struggle. It could be difficulty in a relationship, stress at work, feelings of anxiety or depression, or something from the past that is affecting your life today. Whatever it is, I provide a safe environment in which you can talk in confidence and where you will be listened to with compassion, understanding and without judgement. Working as a counsellor in Gloucester, I believe in the power of relationship: building a relationship with you where trust and acceptance facilitate open communication about the things that are troubling you. I am passionate about my work and committed to helping you explore your difficult feelings and experiences to find a way to feel better and experience life differently. I work with both couples and individulas. Individual sessions cost £70; couples sessions cost £85. I have helped many people in this way, please have a look at my testimonials page to see what others have said about working with me. I work at your pace and offer short term and long term counselling. Counselling sessions are face to face in a comfortable room in either the centre of Gloucester or in Hucclecote. 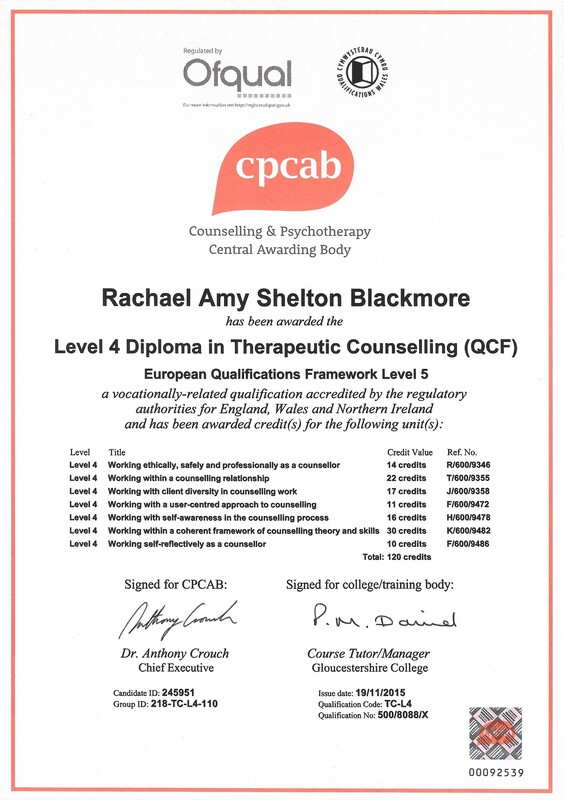 With a Diploma in Therapeutic Counselling, I work as an integrative therapist.This means I draw on the Person-Centred approach and Psychodynamic theory to work collaboratively with you to improve your mental and emotional well-being. I am registered with the BACP. I am more than happy for you to contact me to see how I can help you. Please take a look at my testimonials to see how others have benefitted from working with me.